Not in the sense of being incapable of being defeated because she’s just lost two Ashes matches out of two. We mean it purely in a batting sense. Hartley made nought not out today. In her 20-match international career, she has NEVER BEEN DISMISSED. Now, admittedly, Hartley has only made seven runs in that time, meaning a wicket-to-run ratio of over 4:1, but that’s still a mighty impressive achievement. You wouldn’t catch Don Bradman ploughing through his first 20 international fixtures without ever once being dismissed. He was out loads of times, the charlatan. 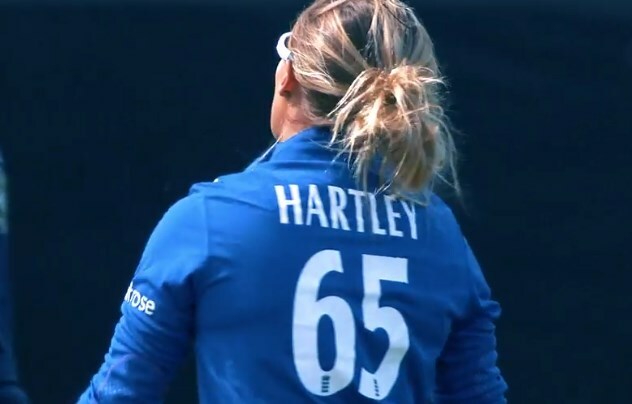 Australia may be 4-0 up on points, but they’ll never see the back of Alex Hartley. Except in the picture above. Twenty international matches. Don’t sell her short. Damn it. We knew Cricinfo hadn’t updated even though it was displaying today’s innings in “latest matches”. Hopefully she doesn’t make 250 in her next innings, it’ll only bring her average down.